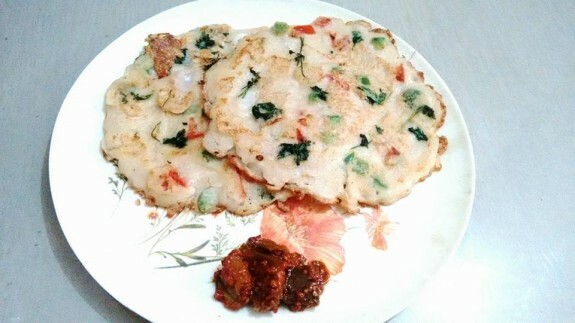 I usually made onion uttapam, onion tomato uttapam by dosa batter but this is really yummy to eat and anyone can made this at home without using dosa batter. This is one of the South Indian dishes which you can have for both in breakfast and snacks as well. 1. Soak Sooji in half cup water and keep it aside for 10 mins. 2. Take a bowl, add curd, salt, soaked sooji and water. Mix the batter. The consistence must be not too thin or not too thick. Now add the veggies into it and mix well. You can keep the chopped veggies aside and use it later one too. 3. Grease a frying pan with butter or oil. 4. Pour 2-3 Tbsp Batter and spread a bit gently. If you not mix the veggies into the batter then sprinkle the veggies now and press with spatula. 5. Add oil around the edges and flip it on the other side. Cook until veggies are cooked. Again turn the other side and cook until the Uttapam is lightly crisp. 6. Serve hot with chutney, tomato ketch up or plain.